Florida is known as one of the best fishing states in the entire US. With the Gulf of Mexico on one side and the Atlantic Ocean on the other, as well as countless lakes, rivers, reservoirs, creeks, mangroves, and waterways all throughout the state, it's no surprise that countless anglers and fishing enthusiasts from all over the world flock to Florida each and every year in search of their next big catch. Fort Lauderdale has its own pier and several other great spots for inshore fishing, as well as many fishing charters running tours in the deeper waters away from the town's beautiful beaches. To put it simply, if you want to do some Florida fishing, Fort Lauderdale is a great place to be. Sailfish - A stunning fish that is easily recognizable for its huge dorsal fin and long bill, not dissimilar to a swordfish. These fish can weigh up to a 200 pounds in rare cases and put up a real fight before finally being reeled in. Blackfin Tuna - The most common kind of tuna in the Fort Lauderdale region, Blackfin will bite almost anything they see and can represent a really impressive catch, growing up to 50+ pounds. Wahoo - Known for their tasty flesh, Wahoo are one of the top sport fishing targets at Fort Lauderdale. They put up a real fight and can grow to huge lengths. In order to have the very best fishing experience at Fort Lauderdale, it’s vital to sign up with a fishing charter. Various charters operate in the area, each offering different advantages and rates. Here are some of the best review fishing charters at Fort Lauderdale. Running 4, 6, and 8 hour fishing trips, Hooked Up Fishing Charters is one of the more experienced and professional operators in the Fort Lauderdale area. This company will cater to everyone from families to work groups. The captain and crew have been fishing in the waters of Fort Lauderdale since the late 60s and offer a really friendly welcome to every passenger who comes on board. Not only that, but the crew will continuously make efforts and do all they can to make sure you have the best possible time and feel fully at ease during your entire Fort Lauderdale fishing trip. These fishing charters target sailfish, sharks, snapper, mahi-mahi, and much more. Lady Helen specializes in deep sea fishing charters off the coast of Fort Lauderdale. Suitable for all ages and experience levels, these fishing charters target the likes of sailfish, mahi-mahi, blackfin tuna, and kingfish primarily, but often tend to find other great catches along the way. 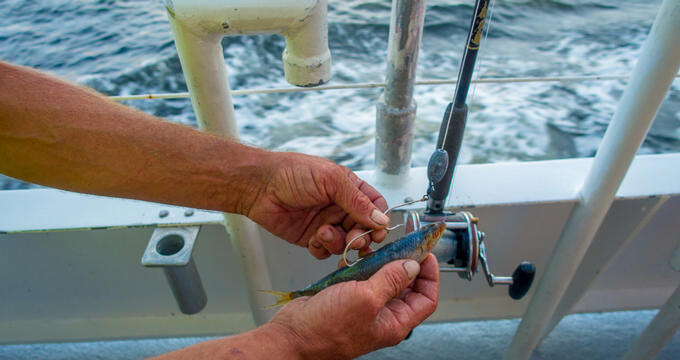 Part of the fun of fishing at Fort Lauderdale is that you never know quite what you'll find each time, but you can be sure of having a fantastic and rewarding experience on board the Lady Helen. The captain and crew of this vessel know all the best fishing spots, including some hard-to-find wrecks that provide the perfect for all sorts of gamefish species. Marlin My Darlin is a sport fishing charter specialist, targeting wahoo, swordfish, sailfish, mahi-mahi, and more, as well as reeling in some huge sharks from time to time. Well suited for everyone from young kids reeling in their first ever catch to seasoned anglers in search of their next big haul, Marlin My Darlin has enjoyed great levels of success in recent years. This 46 foot vessel is equipped with all the amenities and technology needed to ensure that everyone has a great time and nobody goes home empty-handed. If you’re looking for a top quality sport fishing experience at Fort Lauderdale, this is the fishing charter to select.